Taj Palace - Lynbrook uses their own specialised couriers to deliver their food. Home made pastry shaped as pyramids stuffed with cooked potatoes, green peas and spices. Onion fritters served with homemade Sauce. Stuffed with minced chicken Meat. Cauliflower, spinach and potato mixed together with spices in chickpea flour batter and deep fried. Cottage cheese together with spices in chickpea flour batter and deep fried. Tender lamb mince with ginger, garlic, green chillies & herbs rolled on a skewer & cooked in the Tandoori oven. Juicy Lamp Chops marinated in yoghurt, ginger, garlic & other spices cooked in clay oven. Juicy Fillets of fish cooked in tandoor. Cottage cheese marinated in marinated in yoghurt, herbs and spices, cooked in the Tandoori oven. Boneless pieces of chicken marinated in yoghurt, herbs and spices, cooked in the Tandoori oven. Tender chicken marinated in yoghurt, herbs and authentic Indian Spices and cooked in the tandoor. Boneless Fish fillets battered and deep fried. Tandoori Chicken, Chicken Tikka & Seekh Kebab. Boneless pieces of tandoori chicken cooked with tomato spices & finished with a cashew nut cream sauce. 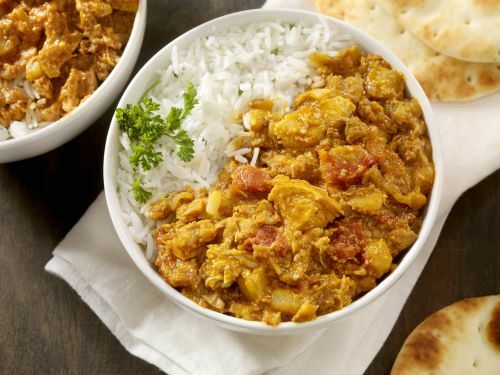 Boneless pieces of chicken cooked with onion, tomato, ginger, and spices. Chicken tikka cooked with tomato, ginger, onion & spices. Boneless pieces of chicken cooked in fresh spinach puree & herbs. Chicken cooked in a white sauce with dried fruits and nuts. Chicken cooked sauteed in black pepper and cooked with onion gravy. Chicken curry garnished in onion rings. Chicken fillet pieces cooked in a delicate sauce. Tender pieces of chicken cooked with curry leaves, mustard seed & spicy sauce. Boneless chicken cooked with hot chilli, spices, vinegar in a special sauce. Tendered chicken cooked with capsicums& chilly soy sauce. Lightly battered chicken in machurian sauce cauliflower marinated with spicy masala and deep fry. Lamb pieces cooked in sauteed capsicum, onion, tomato and herbs. Lamb cooked in a traditinal kashmiri masala and saffron. Lamb pieces cooked with tomato, onion, ginger, green chilli and herbs. Lamb cooked with hot chilli, vinegar in a special sauce. Lamb cooked with fresh spinach puree and spices. Tender pieces of lamb cooked with curry leaves, mustard seed & spicy sauce. Goat cooked with onion, capsicum & tomato. Cooked in hot spices and a touch of vinegar. Beef pieces sauteed in black pepper and cooked with onion gravy. Slices of beef fillet cooked with tomato and capsicum in a delicate sauce and finished with cream. Diced beef cooked in tomato, onion, ginger, fresh coriander and herbs. Beef cooked with hot chilli, spices, vinegar in special sauce. Diced beef cooked with coconut milk, spices, tempered with curry leaves and mustard seeds. Boneless pieces of beef cooked in fresh spinach puree and herbs. Beef pieces cooked with onion, yoghurt & cashew nuts. Pieces of fish cooked in freshly made masala, hot chilli, tanarind and tempered with mustard seeds and curry leaves. Pieces of fish fillet cooked in a mild sauce finished with coconut milk and cream. Pieces of fish fillet cooked with tomato, onion, capsicum and spices. Prawns cooked in mild sauce, finished with coconut milk. Lentils cooked overnight on a slow fire on the tandoori oven with herbs and spices. Whole eggplant roasted in tandoor then pureed & cooked in finely chopped onion, tomatoes, ginger, garlic and peas. Cottage cheese and peas cooked in medium gravy. Cottage cheese cooked with yoghurt, cashew & onion based gravy, finished with cream. Peas and potato cooked in yoghurt and onion based gravy. Cauliflower and potato cooked with ginger, tomato, herbs and spices. Mixed vegetable cooked in onion and yoghurt gravy. Fresh mushroom and green peas cooked in a mild sauce. Cottage cheese cooked in fresh spinach with spices. Grated cottage cheese stuffed with sultanas, cashews, pistachios and coconut dipped in a special sauce. Cottage cheese cooked with capsicum, onion & tomatoes in thick gravy. Grated cottage cheese sauteed with chopped onion green chillies and spices. Vegetables cooked with hot chilli, spices, vinegar in special sauce. Lightly battered balls of mixed mince veggie fritters smothered in a special manchurian sauce of ginger, garlic and coriander. Deep fried cauliflower seasoned with coriander, celery and sauteed ginger and garlic and chilly soy sauce. Whole meal flaky bread with mint. Naan stuffed with home - made cheese and spices. Boiled rice & peas tempered in cumin seeds. Rice stir fried with musted seeds, curry leafs, lemon juice. Rice stir fried with musted seeds, curry leafs and fresh tomato. Rice cooked with nuts, pistachois and sultanas. Rice stir fired with (chicken/ prawn/ egg). Rice cooked with spiced lamb/ beef/ chicken and saffron. Cottage cheese ball deep fried. Cheese patties soaked in thickened milk with nuts.